“The old fashioned form of witchcraft is if someone is behaving badly and you want to correct that person’s behavior you get the mess planted on the doorstep: the signal. Then either the person covers it up or they admit it.But there is always a kind person who comes along (who is what you might term the white witch) and then she has a look and says “Oh, yes, I think you must have upset somebody” and then she will tell you that she knows somebody who is better at this sort of thing than she is. And this person is what you might call the black witch. And so she brings the other opinion in. Another example of this, closer to the assumed cartel connections of the current conflict in Matamoros, is the famed horse head scene in the Godfather movies, the only difference being that when it is associated with witchcraft there is a sense that the object itself attracts harmful forces to the victim through a curse. It’s also the root con in the ‘good cop – bad cop’ routine, and forms the basis for the characters of Mr. Bradley – Mr. Martin in the work of famed social critic William S. Burroughs, himself a student of the ‘black arts’ who gleefully admits in his autobiographical works to spending his last days sending out curses to those he felt deserved an extra bit of misfortune in their lives. When Dr. Andrew Chesnut debated Dr. Antonio Zavaleta on a witchcraft scare related to Santa Muerte in San Benito, New Mexico (Click Here to read the debate) this sort of maleficia (malicious working) is what was implied in Zavaleta’s fear mongering discussion of Brujeria and Curanderismo. Yet, as Williamson demonstrates the two sides of the moral pole work together in traditional societies. This is true in almost all forms of traditional malicious working, and has been shown to be true in Mexican witchcraft, as has been confirmed by anthropologists working more closely in these areas and not relying on their own mythological constructs to block their judgement. When traditions decay you get rogue malcontents, but in traditional working there is no effective black or white magic without an understanding of both. One can notice an interesting alteration that occurs in these transpositions where rational authorities and ‘witch hunters’ themselves begin to take on the role of the ‘white witch’ described by Williamson as they decry the dark workings. Similarly in Matamoros we find the media playing this roll by publicly announcing the effigy and framing it within the symbolic conflict occurring between the cartels, governments, church officials, and Santa Muertistas in Matamoros. Images like those to the right, when they are presented to the media, or to the majority of folks in the United States, can cause a lot of uneasiness as they seem to speak to everything that the Catholic church and the mainstream critics are saying regarding Santa Muerte being Satanic and violent. However, one has to understand that the “Black” version of Santa Muerte is related to protection and these images for many who use them represent wards and warnings no different from a Christian putting a cross on their door to protect against evil, the ‘Hamsa Hand’ in the Middle East and North Africa, or the use of a mezuzah in Judaism. Having grown accustomed to a more homogenized Evangelical Christianity, those in the United States are particularly apt to react strongly when faced with spiritual symbols that depict aggressive imagery. Yet, devotees of Santa Muerte use what is available to them, and these graphic illustrations are readily available due to the preponderance of fantasy art related to the grim reaper. These particular images highlighted above come from T-Shirts made by the Spiral Direct clothing company based in the United Kingdom. While fantasy art may not seem like the most suitable vector of faith for a devotional tradition, this street savvy re-use of common imagery is one of the reasons that Santa Muerte has been so successful in spreading through out the Americas, and more recently throughout the globe. In a previous article, Selling Holy Death (Click Here to read the article,) I addressed the use of Moutain T-Shirt Company’s imagery as they are re-used on t-shirts and devotional images associated with Santa Muerte, and it is not surprising to see similar images of aggressive Grim Reapers from another clothing company being used in the same way. With this said, it must be honestly addressed that the misunderstanding which leads critics to interpret the use of these violent images in a negative light, ignoring their value as protective wards within the tradition, also leads some confused devotees into interpreting them in an active way, as a sign for how to act in their own lives. 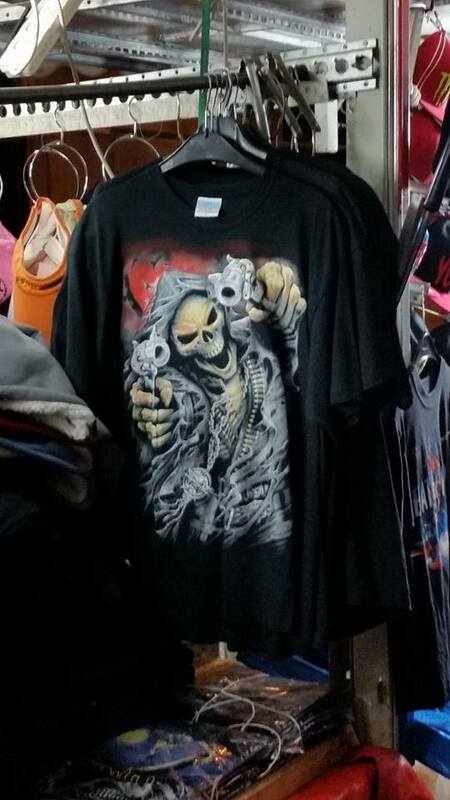 Fantasy images such as these examples, which host names like “Grim Reaper Assassin,” are designed to appeal to a youth engaged in the sub-culture of rebellion in the United States and United Kingdom, youth who rarely face the kind of violence found in the ‘narco cultura’ of Mexico DF. When these images are moved into a more active climate of violence, they can become unintended behavioral cues and grim reminders of the bloody nightmares that have become common fare for the media spectacle surrounding the drug war. This is something that many of the leading Santa Muertistas in the tradition, figures such as Dona Queta, Martin George and Enriqueta Vargas, are actively seeking to educate people about. This also complicates the situation in border towns such as Matamoros, where there is a very real element of cartel involvement among Santa Muertistas in the area. As has been repeated again and again by leaders within the tradition, however, this is reflective of the social condition itself and not indicative of the devotoinal tradition, a distinction not often made in the media or in the demonized accounts from authorities in the government or Catholic church. One might ask, well then why not just get rid of the violent imagery? These protector practices are based on symbology, and therefore the more violent the imagery, the greater the protection. So those working within this system are stuck in a catch 22, watering down the images would be to water down the protection. Yet the very ‘narco’ culture that potentially feeds on the aggressive fantasy art defines the level of protection that devotees feel they need to seek from Santa Muerte in using the same images. In a way, the public emergence of her tradition itself is a sign that we have reached a boiling point where the private, occluded devotions to Most Holy Death are now out in the open as a reminder that the event horizon of cultural collapse is near at hand. 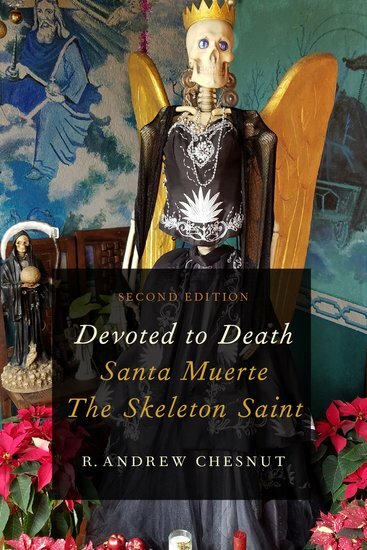 As the Catholic church intensifies efforts to stem Santa Muerte’s growing devotional tradition in the Americas, the media has been unable to resist the tempting stories of exorcism and illicit intrigue that attend the mytho-poetic passion play of a hard fought battle between ‘good’ and ‘evil’. Unfortunately, in only touching lightly on the matter, the media has been largely unable to access the reality of what is occurring during this trying time of social unrest on both sides of the border. Lurid tales of exuberant exorcisms demean both the Catholic and Santa Muertista traditions, and more, these stories demean the lives of those who find themselves struggling to survive as the social contract collapses during a period of dramatic economic and geopolitical change. La Nina Negra, Santa Muerte of the Black Candle, is front an center as an icon of this exchange. While La Santisima’s more ornate forms may be cause for curiosity, it is her position as protector, avenger and some say assassin, that brings the most attention in stories seeking to exploit the public’s credulity through sensationalism and popular tales of ‘narcosatanicos.’ What is the truth behind these tales of vengence and violence? Exploring the darkened realm of Señora de las Sombras (“Lady of the Shadows,” ) this most feared and maligned aspect of Santa Muerte uncovers some of the most interesting and paradoxical factors within her tradition. The realm of maleficia is a misunderstood and difficult area to access. Even scholarly experts on witchcraft and folk traditions have difficulty exploring these practices. It requires not only a deep understanding of the cultures in which they emerge, on the more eerie end of things it also has a habit of carrying a psychological contagion that even skeptics find themselves wary of approaching. In 1942 the psychologist Walter Cannon coined the term ‘voodoo death’ to describe cases of psychosomatic death, ie. cases in whic a curse meant to kill someone appears to work without any known physical cause. One might think that such a surprising theory has been disproven with more recent research, but in this instance further research has actually gone farther to show that this is in fact a very real phenomena, and perhaps more potent than even Cannon’s research suggested. The same principles can be applied to illness in less aggravated instances of the phenomena. Su potente guadaña demuestra que es un ser supremo implacable pero también justo. Este elemento nos recuerda que todos tenemos un ciclo que cumplir, iniciado desde el momento en que nacemos. Este ciclo inicia también el mundo, las vida, la muerte, lo presente, lo porvenir. Porque todo le pertenece, incluso nosotros, y ella le pertenece a Dios. La guadaña como arma, se emplea simbólicamente para cortar las malas energías de los enemigos; de esta forma también estará libre de las malas influencias que le llevan a realizar cosas malignas. Por otra parte, la guadaña, al ser un instrumento de cultivo, es un símbolo de cosecha de la nueva esperanza, por lo que también nos trae prosperidad. En términos generales, ayuda en la prosperidad, cortar energías negativas y da seguridad. De manera simbólica la guadaña se emplea para cortar las energías negativas que cualquier persona este enviando hacia nosotros. Her potent scythe proves to be supremely ruthless but fair. This element reminds us that we all have a cycle to meet, which starts at the moment we are born. This cycle also starts the world, life, death, the present, the future. Because everything belongs to her, including us, and it belongs to God. The scythe as a weapon, is used to symbolically cut the bad energy of our enemies, in this way will also frees us from bad influences that leads to us making evil things happen. Moreover, the scythe, being an instrument of culture, is a symbol of the harvest of new hope, it also brings prosperity. Generally speaking, it assists in prosperity, cutting negative energy and giving security. Symbolically the scythe is used to cut the negative energies that anyone is sending to us. Such a complex symbology for such a simple image reflects the depth and complexity found in Santa Muerte’s tradition itself. It is also clear from this description that for so many Santa Muertistas these symbols which have been associated with fear and violence by the media and by authorities in other religions have a very positive and protective meaning within the devotional tradition surrounding her. It is in the symbolic associations that we find the multi-facted nature of this emergent popular faith and are shown yet again how many different influences can emerge from behind what seems to be a unified outer facade. The media reports a single tradition, yet there are actually any number of traditions emerging beneath the banner of Santa Muerte. In the repurposed t-shirt images shown above we find mention of 7 Rayos, which is a reference to the Palo Mpungu (spirit) associated with thunder(7 thunders,) lightening and fire. Surprisingly, for being associated with the female Santa Muerte, this is a male figure who deals with justice and sexual passions, and is often syncretized with the Caribbean figure of Shango/Chango. 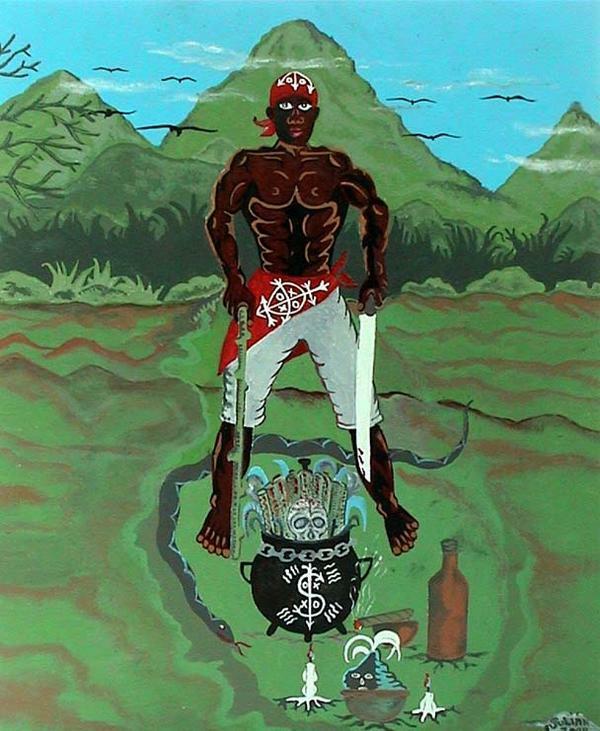 In their less organized expressions both Palo Mayombe, Santeria and groups associated with Shango have been known to pursue very forceful petitionary work, with popular books on the subject often presenting these paths in a sensationalist light very similar to the more extreme accounts of Santa Muerte’s traditions. It is in these popularized forms where loose mixing of influences is most likely to occur. The outer imagery associated with Santa Muerte is being used by any number of different traditions when applied to practical spiritual work. These do not necessarily have the cohesion or internal dialogue fostered by Santa Muertistas associated with the developed shrines, but her much lauded petitionary efficacy is something that opens doors when dealing with practical spirituality. This is a trait that Andrew Chesnut has shown in his work is one of the more popular reasons for people approaching her. So it’s really not surprising if spiritual workers begin to take advantage of this by creating fast and loose syncretisms that seek to tap the potency of her image. Yet, we also see a more nuanced approach, where the subtle implication of these forces are being smoothly integrated in ways that fit with older traditions. In this we can see the same sort of expediency that is found in narco-culture’s appropriation of her imagery, as well as the Catholic churches appropriation of her image in order to provide a foil for church doctrine and government officials appropriation of her image to provide a convenient scapegoat in the drug war. Outside of all of this, however, there still exists a very real tradition with a depth and intimacy focused specifically on Santa Muerte. “Well, sometime this year Ellen was harvesting Milagros for all of us when she came across – here we go – La Santa Muerte, “The Angel of Death.” It seems the peasants in Mexico have had darn near enough with the drug cartels and the senseless killing of thousands. “La policia” aren’t real quick about responding to automatic gunfire and some in fact are “chotas,” which means crooked cops. So the people, most all who have small shrines in their haciendas, have added a new candle – La Santa Muerte. You light one of those and you mean business! Death is a very powerful thing. Now the candle comes in three colors. A white one is for peaceful death, one without pain and suffering which is used for the elderly or for the terrible death of a newborn. A red candle is for love, or – yes — those who die at the hands of a jealous lover. Amid his glaring stereotypes of Latin American culture, Exum finds a sympathy for what he perceives is a faith filled attempt to protect familial connections against the influence of the narco-culture and bureaucratic corruption. Manipulation of imagery to gain a favorable outcome for the practioner forms the core of classic sorcery, so it is no surprise that we would find the strength of Santa Muerte’s iconography being subverted to these purposes. It is still necessary to recognize that this is a component of malefic practical spirituality rather than anything intrinsic in Santa Muerte’s tradition. Further it is important to recognize that in all of this we should maintain a neutrality that allows us to truly appreciate and recognize the complex relationships that are expressed in these associations. The black candle of protection works to test the mettle of those who approach the tradition, her scythe dividing the true from the false, her scales weighing the sincerity of any cultural appropriations. Maintaining distance and appreciating the complexity of these practices we gain a better understanding of the deep and often unseen streams of influence that create culture. Streams that run deep enough for a Tennessee conservative to find common ground with families in Mexico DF. The simple act of reacting to negative experiences when ritualized through traditions such as the devotions surrounding Santa Muerte become mirrors for our most raw and humane moments of truth. These are not alien and exotic experiences, but the very raw root of life expressed with a direct symbolism that requires us to face up to very stark expressions of light and dark. La Nina Negra and La Nina Blanca do not exist in opposing polarities, they exist in a single figure, multi-facted and expressive of the inexpressible unity of being, sharing the truth in a way that only death can, with the cold judgement of empty eyes and a wide, unwavering grin.